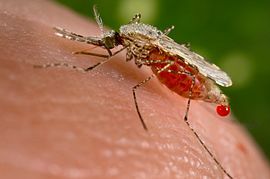 Malaria is transmitted by the bite of an infected Anopheles mosquito. Falciparum malaria in particular represents a serious public health problem as it may cause severe and fatal infections. The early clinical features of malaria are non-specific and include fever, chills, myalgia, arthralgias and headache. These may resemble the early stages of other febrile illnesses. Patients are hence advised to see their family doctor especially if they have fever and have been to/living in malaria-receptive areas (areas with known presence of anopheles vectors, e.g. P. Tekong, Jurong Island, Mandai areas), or a travel history to countries where risk of transmission of malaria is high. The incubation period of malaria is usually in the range of 9-40 days but can be as long as 12 months or more. Use insect repellent containing DEET on exposed skin as well as on clothing. Wear thick clothing to cover up as much of the body as possible when going out at night. Avoid being outdoors between dusk and dawn as far as possible. Close windows and doors at night. Use a mosquito net over the bed, with the edges tucked in under the mattress. Ensure that the net is not torn. Sleep in the middle of the bed, avoiding contact between body and the net. Use an insecticide-treated mosquito net as far as possible. Malaria during pregnancy increases the risk of maternal death, miscarriage and neonatal death. Thus, pregnant women should be advised to avoid traveling to malarious areas unless absolutely necessary. The early clinical features of malaria are non-specific and include fever, chills, myalgia, arthralgias and headache. Depending on the malaria risk in the area visited, chemoprophylaxis may also be necessary in addition to mosquito bite prevention measures. There are various chemoprophylactic agents, all of which have specific indications, contraindications and side-effects. The risk of malaria infection varies among countries and between different areas of each country. In areas with only very limited risk of malaria transmission, chemoprophylaxis may not be indicated, as the risk of side effects associated with antimalarials may outweigh the potential benefits. In areas where only P.vivax occurs, and those few areas where P.falciparum remains fully sensitive to chloroquine, chemoprophylaxis with chloroquine can be used. In areas with a high risk of P.falciparum malaria or reported antimalarial drug resistance, the chemoprophylaxis choices are atovaquone-proguanil, doxycycline or mefloquine. The choice of drug depends on the reported resistance pattern in the area to be visited, the contraindications of the various drugs, and personal preferences. All prophylactic drugs should be taken with unfailing regularity for the duration of the stay in the malaria risk area, and should be continued for 4 weeks after the last possible exposure to infection. The single exception is atovaquone-proguanil, which can be stopped 1 week after return because of its effect on liver stage parasites. The risk of developing malaria during or after travel to a malaria-endemic area is reduced if the recommended drug regimen is adhered to. However, chemoprophylaxis does not provide complete protection and should always be combined with personal protective measures against mosquito bites. · Only mosquito bite prevention necessary. · Mosquito bite prevention plus chloroquine chemoprophylaxis required. · Mosquito bite prevention plus chloroquine plus proguanil chemoprophylaxis required. Malaria risk—predominantly due to P. falciparum—exists throughout the year in the whole country except in Phnom Penh and close around Tonle Sap. Risk within the tourist area of Angkor Wat is limited. P. falciparum resistant to chloroquine and sulfadoxine–pyrimethamine reported. Resistance to mefloquine and tolerance to artesunate reported in south-western provinces. Level of prevention recommended is Level IV for all areas. Malaria risk exists throughout the year in all areas of the five eastern provinces of Papua, West Papua, Maluku, North Maluku and East Nusa Tenggara. In the other parts of the country, there is malaria risk in some districts, except in Jakarta Municipality, big cities, and within the areas of the main tourist resorts. P. falciparum resistant to chloroquine and sulfadoxine–pyrimethamine reported. P. vivax resistant to chloroquine reported. Level of prevention recommended is Level IV in selected risk areas. Malaria risk—predominantly due to P. falciparum—exists throughout the year in the whole country except in Vientiane. Chloroquine and sulfadoxine–pyrimethamine resistant P. falciparum reported. Level of prevention recommended is Level IV for all areas. Malaria risk exists only in limited foci in the deep hinterland. Urban and coastal areas are free from malaria. P. falciparum resistant to chloroquine and sulfadoxine–pyrimethamine reported. Human P.knowlesi infection reported. Recommended prevention in risk areas is Level IV. Malaria risk—predominantly due to P. falciparum—exists throughout the year at altitudes below 1000 m, excluding the main urban areas of Yangon and Mandalay. Risk is highest in remote rural, hilly and forested areas. P. falciparum resistant to chloroquine and sulfadoxine–pyrimethamine reported. Mefloquine resistance reported in Kayin state and the eastern part of Shan state. P. vivax with reduced sensitivity to chloroquine reported. Human P.knowlesi infection reported. Recommended level of prevention is IV for all areas. Southern Leyte, Marinduque, Masbate, Eastern Samar, Northern Samar, Western Samar, Sequijor, Sorsogon, Surigao Del Norte and metropolitan Manila. No risk is considered to exist in urban areas or in the plains. P. falciparum resistant to chloroquine and sulfadoxine–pyrimethamine reported. Human P. knowlesi infection reported in theprovince of Palawan. Recommended level of prevention is IV for at risk areas. Malaria risk exists throughout the year in rural, especially forested and hilly, areas of the whole country, mainly towards the international borders, including the southernmost provinces. There is no risk in cities (e.g. Bangkok, Chiangmai city, Pattaya), Samui island and the main tourist resorts of Phuket island. However, there is a risk in some other areas and islands. P. falciparum resistant to chloroquine and sulfadoxine–pyrimethamine reported. Resistance to mefloquine and to quinine reported from areas near the borders with Cambodia and Myanmar. Human P. knowlesi infection reported. Recommended level of prevention is Level I for risk areas and Level IV for areas near Cambodia and Myanmar borders. Malaria risk—predominantly due to P. falciparum—exists in the whole country, excluding urban centres, the Red River delta, the Mekong Delta, and the coastal plain areas of central Vietnam. High risk areas are the highland areas below 1500 m south of 18°N, notably in the 4 central highlands provinces Dak Lak, Dak Nong, Gia Lai and Kon Tum, Binh Phuoc province, and the western parts of the coastal provinces, Quang Tri, Quang Nam, Ninh Thuan and Khanh Hoa. Resistance to chloroquine, sulfadoxine–pyrimethamine and mefloquine reported. Recommended prevention in risk areas is Level IV.